So I'm working on answering these questions for my interview with Wellesley Magazine (look for it in the next issue, I guess? I don't actually know when it's going to run) when I suddenly remembered this comic strip I drew, back in March of 1998. I apologize for the state of the image, but I just scanned it from the original, and the original, sadly, was water damaged many years ago from some flooding that we had in our apartment. It's still basically legible though, and reading through this, and other comics from my tenure as the cartoonist at The Wellesley News (a position I held for three years, mainly because no one else wanted to do it), I was surprised to see that many of them held up pretty well. I mean, some of them are very Wellesley-specific--some of the references I don't even get anymore, and I wrote them--but many, many of them could be comics about college life in general. So! Here's what we're going to do. I'm going to scan some of the old comics. And I will post them up here sequentially. And you can read them. You'll have to remember though, that I drew these a long time ago. 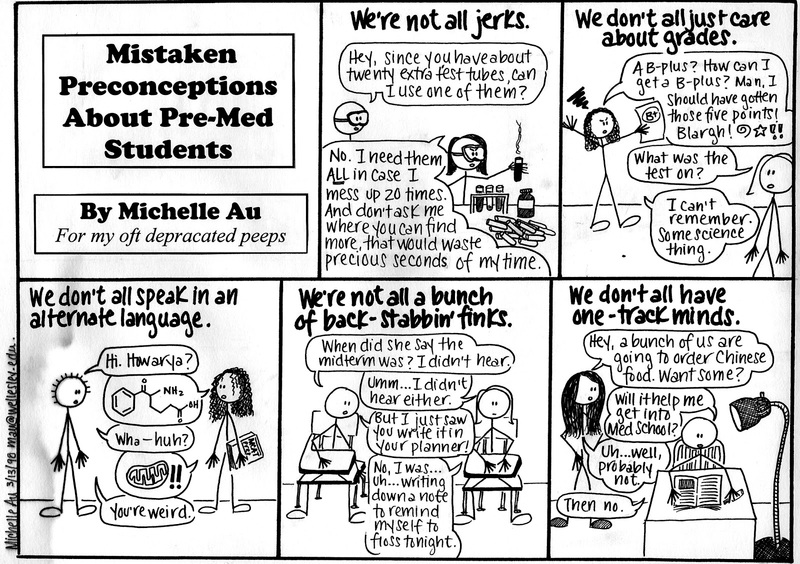 In March of 1998, when I drew this particular comic about pre-meds, I was nineteen years old. Some of the comics are also a victim of their times, as my unfortunate and un-ironic use of the word "peeps" probably shows. But they can be taken for what they are, which is vintage snapshots of me, doing what I still do today, in embryonic form. I was much more prolific with my cartooning then--I had to do one new comic a week every week for the school year, and some of them were, admittedly, a little rushed. But I never skipped a week, I never ran a repeat, and I never missed a deadline, even when I had pneumonia and the shingles back-to-back the winter of of my senior year. That's an ISTJ for you. (Sorry for referencing that personality test thing again, but really, if you ever wanted to know anything about me, read that link, it has me nailed down to a tee.) By the way, in addition to this weekly comic strip, and I also had a weekly humor column in The Wellesley News--a form and style of writing which eventually begat this very blog, and then the book. So thank you Wellesley, for getting me started. Anyway, look here in the upcoming days for more comics from my old college strip, and try not laugh at me too much. Or, laugh, but because you think the comics are funny, not because, I don't know, the idea of college me sitting alone in her room drawing comic strip after comic strip is just too dorky to tolerate. Fish gotta swim, birds gotta fly! And if you're still in Boston or thereabouts, maybe I'll see you May 16th, during my reading at The Coop. Afterwards, we can wear our pajamas to the dining hall, make nachos in the microwave, and then talk about feelings. YES. Can I put in a request for the always-pregnant diagnoses at the WC health center? I double-majored in two humanities subjects, so I probably wrote thousands of pages at Wellesley, and yet I still can't find the words to describe how much we adored your comics. I think you're a wonderful writer and your style/wit has developed nicely since 1998, when I started reading you, but it's your comics that really delight me. Your next book should be a graphic novel! I really wish that there were a way to reprint Mau's Little Red Book - those comics take me back to Swellesley and gently mock the ethos of Wellesley while still being affectionate towards the school. Yes to a reprint of Mau's Little Red Book! They were sold out by the time I tried to buy one, and people hoarded their copies like Gollum. My husband (he was a cartoonist for his school's paper, too) and I both read your strip while I was at Wellesley. It was the news of your book and the love of your old comics that drew me to your blog! Very cool! :) Looking forward to seeing more of the comics. So funny! I was/am pre-med and the comic depicts how 95% of the pre-meds acted at my school. I never quite fit in :) hopefully I'll still make it to med-schoold despite that Chinese food ;) Quite good for your 19 y.o self! This is so crazy to me. I swear, I was just thinking about Mau's Moments earlier today. I was back on campus briefly recently and was reminiscing about the Beebe days (and have been reading your blog for years). You know, I didn't hold much stock in The Secret before, but if I can make Mau's Moments reappear, I'd better get working on visualizing a gajillion dollars. My good lady, could you possible be any more amazing?! Seriously, it's bordering on the ridiculous. Confession: I secretly (well, not any more) wish for you to have a daughter next year, who will inherit all of your amazingness (I know it's not a real word, but you know what I mean) so that she can become my daughter-in-law in about 25 years. Given your background you must realize that there is no greater compliment I, as someone with a pseudo-Asian my-boy-child-is-god background, can offer you. ^ now THAT is a compliment. awesome comics, Michelle! I kind of wish I had attended your alma mater so I could get in on the inside jokes too. fingers crossed for ones parodying life at CUMC? 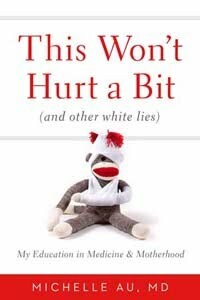 can't wait to read the book soon - amazon says it's being released a week and a half early! You have a spectacular wit. You're the kind of writer whose blog I will read through entirely. You're sense of humor, even as it deals with adversity and darkness, is refreshing. Ah, there is no shame to putting "Wellesley News columnist" on your ERAS. I totally did. Michelle, I looked forward to your comics every week when I was at Wellesley. They were like a ray of sunshine, and I remember laughing out loud regularly because of them...so however lame you think they are now, I truly thought you were a cartoon writer of the gods. Thank you. Can't wait to read your book! Michelle, I still quote your columns to my students sometimes, particularly the one about test taking tips (look on both sides of the page: "wow, I can't believe I finished that exam in exactly half the time allotted!"). I believe there was also one about not being prepared for an orgo test. And I remember the one about your little sister and the keychains on her backpack. I would love to see a few of those classic columns posted some time. Very sadly (and I say that only in the sense that sometimes it's fun to read things that you wrote when you were a teenager and cringe over how bad they were) I have no idea where the files of my old Wellesley News columns are. I suppose they exist within the copies of the newspapers themselves, but I can't think of a really good way to reproduce them short of transcribing them. I have a hunch they really weren't very good anyway, I just think the sentimentalist in me wishes I had them for my own records. Thanks for remembering them so fondly, though! Yes, that's me. And I think the columns really were good - lots of people here remember them fondly. I have the Harvard book signing on my calendar and am hoping to be there. If that pre-order really ships early I will have read the book by then, too. Good thing I don't have it now, though, because there are final exams to be written.